In 5-quart Dutch oven, heat butter over medium-high heat. Stir in celery and onion. Cook 10 minutes, stirring frequently, until vegetables are tender. Add potatoes, broth, bouillon, and pepper. Bring mixture to a boil; reduce heat to medium-low. Cover; simmer 30 minutes, stirring occasionally, until potatoes are tender. Let cool15 minutes before processing in food processor. Meanwhile, heat oven to 400°F. Spread tortilla strips on large baking sheet. Spray strips with cooking spray. Bake 10 minutes, stirring after 5 minutes. Let cool. In blender or food processor, place cilantro and one-fourth of soup mixture. Cover; blend on high speed until smooth, scraping down sides of blender if needed. Repeat in 3 batches with remaining soup. Return mixture to Dutch oven. In small bowl, combine half and half and yogurt. Stir into soup. Heat over medium heat, stirring with whisk; until blended and hot (do not boil). Top each serving with tortilla strips and cilantro. 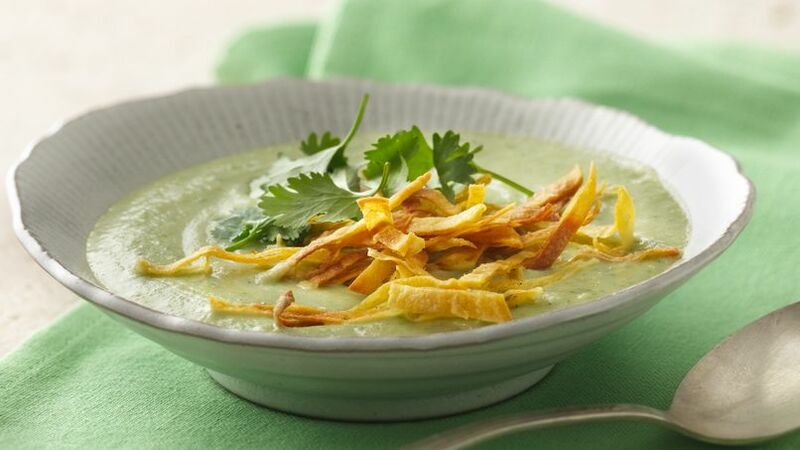 Chicken broth, cilantro and yogurt come together in this tasty soup - a perfect side dish.